Use our custom vanity countertop designer below. Once you’ve finished designing it, you can order it and it will be delivered to your door. If you have any questions, please call us at (503) 588-0180. For instructions on how to use the Custom Vanity Countertop Designer, or for assistance on finding the proper dimensions for your countertop, download our instruction sheet here. Note: All stones are 3cm thick. For instructions on how to use the Custom Vanity Countertop Designer, or for more information on our selection of stones, download our instruction sheet here. For instructions on how to use the Custom Vanity Countertop Designer, or for more information about Polished Edges and Backsplashes, download our instruction sheet here. Front is always polished in the manner selected above. Note: Polished edges can't have a backsplash. Backsplash is 4"x3cm, and can be milled to 2cm for $200. Note: Edges with backsplash can't be polished. 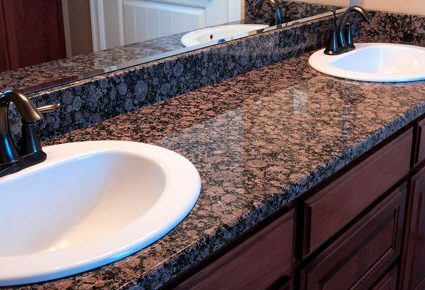 Vanity countertops under 60" can accommodate 1 sink, while those 60" or over can accommodate up to 2 sinks. By default, sinks are centered horizontally in the countertop. For more information on sink placement and adjustments, please view our instruction sheet here. The default backspacing (amount of material showing in front of the sink) for Oval Sinks is 3.5", for Rectangle Sinks is 4", and Vessel Sinks is 7.5". For more information on sink placement and adjustments, please view our instruction sheet here. From here you can place your order, or to email it to yourself for future reference. By checking this box, I understand that the vanity countertop I have built in the designer is exactly how I'd like to receive it. The dimensions, edge types, stone color, and all other specifications will be made how I have described them in the builder. By checking this box, I understand a representative from Keystone Granite will reach out to me about the countertop I have designed, prepared to answer any questions I have. If you have any questions, comments, or concerns – please call us at (503) 588-0180.